What Would the Terraforming of Mars Look Like? Could humans ever live on Mars? 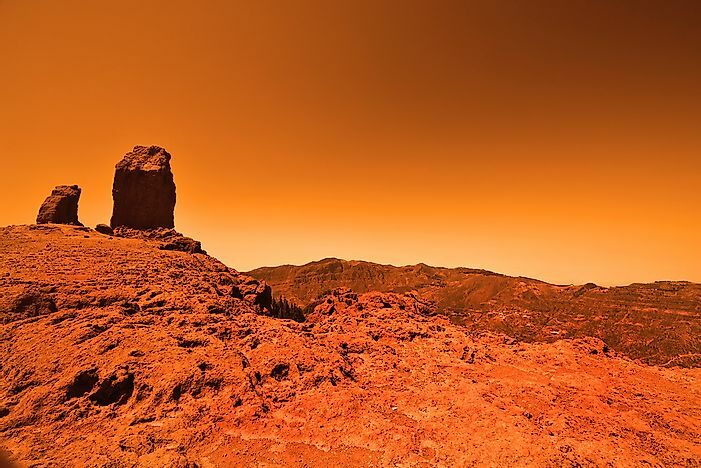 What is it about the Red Planet that makes it so inhospitable to human life? These are questions that that research into the terraforming of Mars aims to find out. Could the terrain of Mars ever sustain human life? Terraforming Of Mars: What Does It Mean? Planetary engineering is the use of technology with the aim of influencing the global environments of other planets in order to increase their potential to be inhabited by humans. Terraforming refers to the planetary engineering technology that would change the climate of planet Mars and transform the planet to one that supports the life forms living on planet Earth. One possible way to change this involves reducing excess heat by trapping carbon dioxide from the Martian surface back into the atmosphere. Some of the concepts proposed for terraforming Mars are currently prohibitive regarding natural resource and economic costs, while others are arguably more feasible and achievable with future technology. Terraforming Mars would bring about three main interrelated changes: the building up the atmosphere, the raising of Mars' temperature, and the building up the magnetosphere. The Martian atmosphere is thin and has an extremely low surface pressure compared to the atmosphere of the Earth. Its atmosphere is primarily made of carbon dioxide, a noted greenhouse gas, and once Mars begins to heat, the carbon dioxide may help to keep thermal energy near the surface of Mars. Furthermore, as it heats, more carbon dioxide should be introduced to the atmosphere from the iced reserves on the poles to enhance the greenhouse effect. The two operations of building the atmosphere and grilling it would offer a symbiotic improvement in favor of terrforming. However, due to a lack of global magnetic fields, keeping the atmosphere tight is a challenge. The basic plan for making a livable environment on Mars is to introduce enough greenhouse gasses into the Martian atmosphere through a cycle of warming, melting the polar ice caps and releasing carbon dioxide. Based on this plan, it is projected that scientists could fully terraform Mars in about 100,000 years. Some argue that the Earth's growing human population requires more resources and alternative solutions, leading to the idea of colonizing other planetary bodies that have similar characteristics to Earth, such as Mars and the Moon. The planet Mars is the most Earth-like of all the planets in the solar system and may have had an even more Earth-like environment throughout its history, with a theorized thick atmosphere and plenty of water that was lost over millions of years. The proximity of the planet paired with the similarity of Mars with the Earth makes it the most feasible terraforming target in the solar system. Ethical considerations of terraforming surround the possible displacement or extinction of indigenous life, like the microbial, if such life exists, and the question of whether or not it is the right of humans to expand their existence into the extraterrestrial. There are considerable challenges in attempting to terraform Mars, particularly the key environmental factors of air pressure and low gravity. The gravity at the surface of Mars is at 38% that of the planet earth and it is not known if it is enough to prevent problems arising from weightlessness. Some of the problems experienced by astronauts who have experienced weightlessness include vomiting, nausea, lethargy, headaches, vertigo, and overall malaise. Other extreme cases include muscle atrophy, skeleton deterioration, redistribution of body fluid, slowing of the cardiovascular system, reduced production of red blood cells, weakening of the immune system, nasal congestion, balance disorders, sleep disturbance, loss of body mass, and eyesight problems among other complications. The surface pressure on Mars is extremely low, way below the critical Armstrong limit of 6kPa meaning that exposed body liquids like tears, saliva, and the wetting liquid in the alveoli within lungs will boil away. What Did Baroque Dance Look Like? What Is Ambient Music? What Does It Sound Like?